Monsignor Robert Armstrong, the former rector of the Cathedral of Mary Our Queen in Homeland for a quarter century and a man who inspired countless religious vocations over the course of his 55 years as a priest, died March 7 after several years of declining health. He was 81. As rector of the cathedral from 1984 until his 2009 retirement, Monsignor Armstrong oversaw many capital projects including major repairs, the restoration of the organs and the erection of a parish center. He also stood side by side with St. John Paul II when the pope visited the cathedral in 1995. But it was the priest’s strong example of faith and an unbreakable bond with parishioners that will be his lasting legacy, according to those who knew him. 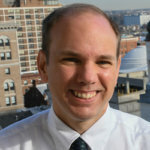 “The best way I can describe him is to say that he took very, very seriously what the church asked him to do through ordination,” said Father Gilbert Seitz, judicial vicar of the Metropolitan Tribunal, who received his first Communion from Monsignor Armstrong at Immaculate Heart of Mary in Baynesville in 1962 when Monsignor Armstrong was a young associate pastor. Father Seitz said his own religious vocation was inspired by his mentor, as were those of many other priests. As rector of the cathedral, Monsignor Armstrong worked with numerous seminarians, deacons and young newly ordained priests stationed there. Father Louis Bianco, priest-secretary to Archbishop William E. Lori, was a newly ordained priest who served as an associate pastor at the cathedral under Monsignor Armstrong. When he arrived at the cathedral in 2005, Father Bianco asked the rector to teach him how to do the job of a pastor so he could learn how best to fulfill that ministry. 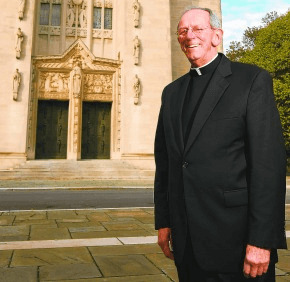 Monsignor Richard Hilgartner, pastor of St. Joseph in Cockeysville, said Monsignor Armstrong’s devotion to his parishioners at the cathedral was “unmatched.” He connected to people because he had significant insights into the human condition, Monsignor Hilgartner said. Monsignor Hilgartner was a college candidate for the priesthood when he first met Monsignor Armstrong. He later served as a deacon and then associate pastor of the cathedral under Monsignor Armstrong. After his retirement, Monsignor Armstrong assisted with celebrating Masses and hearing confessions at St. Joseph in Cockeysville. Because of problems with balance, Monsignor Armstrong restricted his ministry at the parish to the sacrament of reconciliation in the last 18 months, Monsignor Hilgartner said. Monsignor Richard Woy, current rector of the cathedral, said his predecessor was wholly devoted to his parishioners. In a tribute published on the cathedral’s website, Mary Beckenholdt remembered how Monsignor Armstrong offered consolation to her family through two tragedies. Her son, Daniel, was an altar server for the priest. When Daniel’s father was nearing the end of his life, the son called Monsignor Armstrong to provide last rites. Later, when Daniel was killed in an accident in 2013, Monsignor Armstrong called to offer support to Daniel’s mother. The priest later told Beckenholdt that he kept a photo of Daniel in his residence at Mercy Ridge Retirement Community in Timonium and prayed for him. Lori Brooks, an active cathedral parishioner whose husband, Jay, served on the church’s finance committee, said Monsignor Armstrong went “above and beyond” to show his gratitude for their service to the parish and was a frequent dinner guest in their home. Through the priest’s connections in Rome, he was able to arrange for her family to meet St. John Paul II in 2000. Beverly Ann Osterbur, Monsignor Armstrong’s niece, said her uncle always made himself available to celebrate first Communions, weddings and other sacraments for family members – even traveling to her home in Georgia. “He was at everything he could be,” she said. Monsignor Armstrong enjoyed yearly visits to Rome and eating steamed crabs in Ocean City with brother priests. Known for his quick wit, he was also interested in art, culture and architecture. Born in Pennsylvania and raised in New Jersey and Baltimore, Monsignor Armstrong spent three years in the Augustinian novitiate before deciding to become a diocesan priest. After Monsignor Armstrong studied at Mount St. Mary’s Seminary in Emmitsburg, Cardinal Lawrence Shehan ordained him to the priesthood in 1962 inside the cathedral the priest would one day lead. Monsignor Armstrong taught religion at Seton High School in Baltimore and was the chaplain of the Maryland Training School for Boys. He was an associate pastor of Immaculate Heart of Mary in Baynesville and served as associate director and director of the archdiocesan Office of the Confraternity of Christian Doctrine. In the late 1970s, Monsignor Armstrong assisted at the South Baltimore parishes of Holy Cross; St. Mary, Star of the Sea and Our Lady of Good Counsel, and was the master of ceremonies for Cardinal Shehan and Auxiliary Bishop T. Austin Murphy. The priest was named pastor of St. Michael in Overlea in 1978 and rector of the cathedral in 1984. In a 2009 interview with the Catholic Review, Monsignor Armstrong said he loved each of his assignments. He especially enjoyed celebrating Mass and being present with parishioners for special moments. He was touched when then-Archbishop Edwin F. O’Brien referred to him as “the indomitable, irrepressible Monsignor Robert Armstrong” during a 2009 Mass celebrating the 50th anniversary of the cathedral. The comment sparked a standing ovation that lasted several minutes. An even greater honor came in 2010 when Monsignor Armstrong was named Protonotary Apostolic Supranumerary, a rare and high papal honor and the highest grade of monsignor. At the time, Monsignor Armstrong was the first in the Archdiocese of Baltimore to receive the designation in approximately three decades, according to Monsignor Hilgartner. Monsignor Hilgartner and Father Seitz acknowledged that leaving the cathedral was one of the most difficult times in their friend’s priesthood. It meant that he could not provide pastoral ministry in the way he always relished. Monsignor Armstrong will lie in state at the Cathedral of Mary Our Queen 2-9 p.m. March 12, with a vigil service at 7:30 p.m. A funeral Mass will be offered at 10:30 a.m. March 13 at the cathedral. Cardinal J. Francis Stafford, former auxiliary bishop of Baltimore and a close friend of Monsignor Armstrong, will be the homilist.